Ford is renewing its entire commercial lineup in Europe during the next 18 months, starting with the Transit Connect and Transit Courier. Featuring stylish new designs, more fuel-efficient powertrains and advanced new driver assistance technologies, the two new Transit models will be available to order in spring 2018 for customer delivery from the middle of the year. The new Transit Connect delivers a bolder design and fuel-efficient engines with the all-new 1.5-litre EcoBlue diesel and 1.0-litre EcoBoost petrol featuring cylinder deactivation. The former engine combines the latest fuel injection, turbocharging and emission-control technologies with a low-friction design to deliver improved performance alongside reduced fuel consumption. An upgraded six-speed manual transmission is now fitted to all engines as standard. The 1.5-litre EcoBlue engine can also be specified with an advanced new eight-speed automatic transmission, which has been engineered to deliver optimised fuel-efficiency alongside responsive performance and smooth, swift gearshifts. A smart new front-end appearance adopts the latest Ford design DNA. 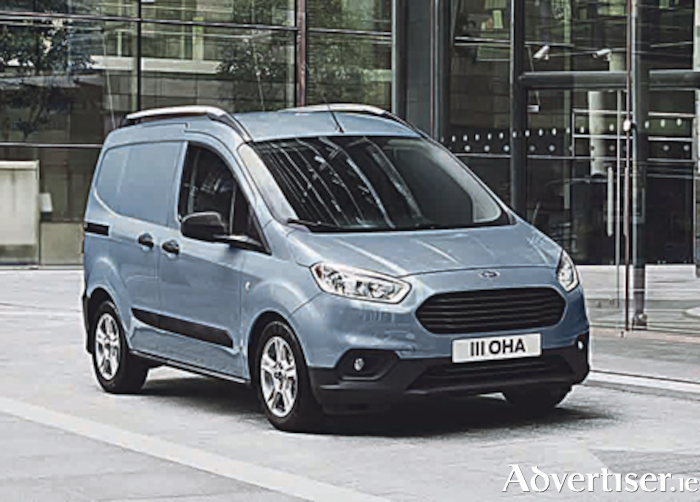 An imposing three-bar Transit grille combined with slimmer headlamps - with powerful HID Xenon lamps and LED daytime running lights available on high series models - combine with a more aerodynamic lower fascia and front spoiler to deliver the fresh new look. Inside the Transit Connect, an upgraded cabin features a revised instrument panel with a new central control area that incorporates a floating, tablet-inspired 6-inch colour touchscreen on high series models, featuring Ford’s SYNC 3 communications and entertainment system. New trim materials provide a stylish and hard-wearing working environment. Like the outgoing model, the new Transit Connect offers commercial vehicle operators an outstanding breadth of capabilities, with short and long wheelbase options providing load volumes up to 3.6m3, payload capacity ranging from 520-890kg, and bodystyles including van, kombi and double-cab-in-van. Meanwhile the compact new Transit Courier offers updated powertrains with standard six-speed transmission, SYNC 3 technology and refreshed front-end appearance. For the ultimate in low running costs, a new fuel-efficiency package is offered as standard on diesel models, which integrates optimised aerodynamics with an Active Grille Shutter that improves warm-up times and reduces drag. The new Transit Courier offers urban van operators a payload capacity ranging from 500-590kg, load volumes up to 2.4m3, and a choice of van and kombi bodystyles.